From the beginning of this project, my goal in renewing the Ontario Medical Foundation was to help Ontario physicians dare to turn their dreams into reality. Doctors dream of better ways to practice medicine, better ways to learn, better ways to do research – they dream of ways to change medicine and, in so doing, to change the world. It is my hope that, in renewing the Ontario Medical Foundation, the Foundation’s Governors and Members will be inspired by the possibilities of physicians’ desires to lead change. They will become the ambassadors for this potential. What is most exciting is that there is no limit to what might be achieved; the physicians who use this Foundation’s resources will apply for assistance for projects the Governors do not envision. The Systems Level Challenge is to renew the Foundation in such a way that it is always ready to leverage today’s achievement for tomorrow’s benefits. The Ecocycle is a liberating structure that encourages an organization to embrace a cycle of both renewal and creative destruction. This is a model that organizations can use to stay focused at those times when productivity ebbs. October 2015: Review existing research. 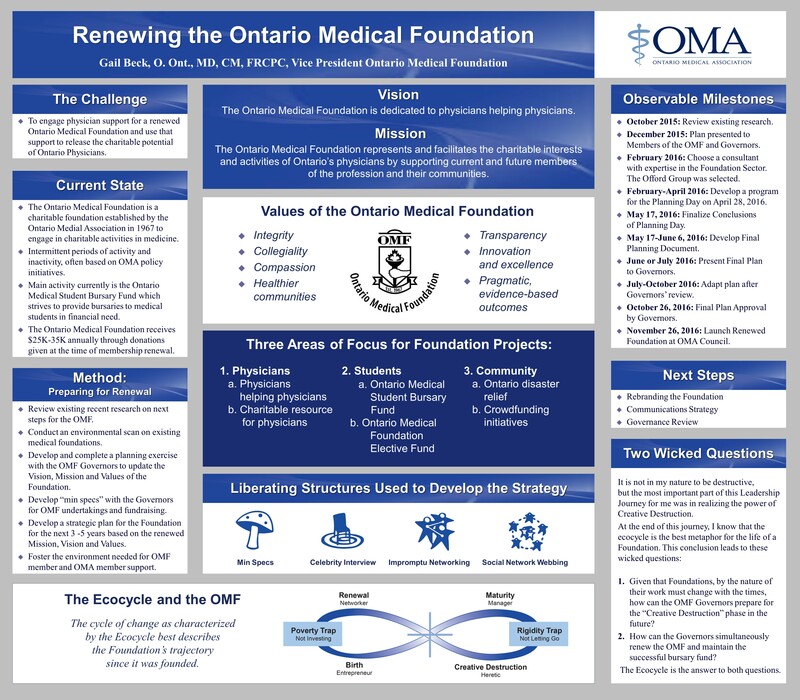 December 2015: Plan presented to Members of the OMF and Governors. February 2016: Choose a consultant with expertise in the Foundation Sector. The Offord Group was selected. February-April 2016: Develop a program for the Planning Day on April 28, 2016. May 17, 2016: Finalize Conclusions of Planning Day. May 17-June 6, 2016: Develop Final Planning Document. June or July 2016: Present Final Plan to Governors. July-October 2016: Adapt plan after Governors’ review. October 26, 2016: Final Plan Approval by Governors. November 26, 2016: Launch Renewed Foundation at OMA Council. I started my Physician Leadership Development Journey fully aware of my capacity to step into a crisis and manage it. As a psychiatrist, my work is to be the supportive catalyst, allowing others to develop, without being in the spotlight myself. This project required me to develop a more charismatic leadership style, to begin to influence work and outcomes by inspiring my colleagues to give…to give their time, their ideas, their money to promote the charitable work of a Foundation for Ontario physicians. It is a leap outside of myself, away from doing myself to convincing others to do. Most of the liberating structures I employed were related to networking and reaching out, developing the skill of being comfortable inspiring others, and finding ways to do this. These renewed “Min Specs” for the Ontario Medical Foundation came together beyond what I had hoped. I am excited to see what dreams they will make come true!